The Moonlighters- bluegrass and Old Time Music. 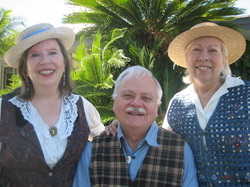 The Moonlighters Trio consists of Evan Anderson, on bass, mandolin ,and vocals, Patty McCollom on banjo, fiddle, tinwhistle, and vocals, and Barbara Whitney on fiddle, banjo and vocals. The Moonlighters are friends of long standing, who have played together in a variety of bands over the years. These musicians played in Scotland and Ireland together as part of the Men of Worth Tour and play together often in Southern California.